Our latest innovations to the Authentic Cycle product line are a reflection of our renewed energy and continued commitment to intelligent design, quality manufacturing and authentic riding experiences. We now offer a greater selection of bikes with more customization options than ever before. 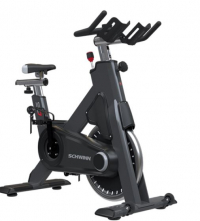 So take a look and see why the most demanding fitness enthusiasts in the world ride Schwinn. 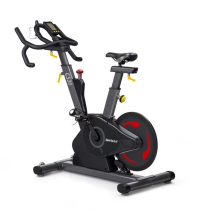 Schwinn’s whisper quiet Smooth Cycling series allows riders to channel their attention to any experience that a studio is striving to achieve. The SC 7 is combines user-focused features, best-in-class biomechanics and a high degree of adjustability to deliver the optimal bike fit for riders of all shapes, sizes and abilities. 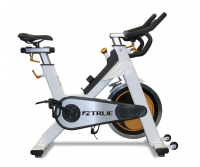 To maintain uncompromising quality ride after ride, the Studio 7 features a patent-pending bottom bracket that exceeds industry standards, rust-defying materials and rock solid construction. We’ve selected components that are low maintenance and offer uncompromising quality ride after ride. Our patented, durable and threadless Morse Taper design keeps the pedals fastened tightly to the bike and prevents breakage. With a Q factor of 162 mm, and smooth belt drive, our drivetrain provides a comfortable ride that users will love. The M3i is the first to feature a Bluetooth wireless computer. For group exercise classes, data from the M3i computer can be projected onto a display. With an app, riders can download data from the computer to their smart phone or tablet! 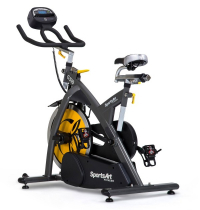 SportsArt takes indoor cycling to a whole new level of energy and competition. With a precision machined flywheel, fully enclosed drive belt, and extra wide base, the C510 offers an experience most users have never felt before. Combining ergonomic handelbars and user-focused feature adjustablilty; cyclists can focus on their workout, rather than their ride position. The C530 has a stylish rear fly-wheel design with a self powered, zero-friction magnetic braking system and a whisper quiet poly-v belt for smooth reliable operation. The oversized LCD display shows multiple data metrics and features a built in LED light that changes color based on RPM rate.